1. Holmenkollen Ski-Jump, Norway: Located at the top of a vertiginous ski jump in Norway, this space is where athletes usually prepare for a jump during events like the Ski Jumping World Cup, but this year it was coolly transformed into a penthouse apartment, complete with panoramic views of Oslo through its ceiling-to-floor windows, and (fingers crossed) the Northern Lights from the rooftop terrace. After perusing the world’s first ski museum just downstairs and breakfasting in the VIP lounge, you can check out via zip-line – yes, you read that right! The space was actually set up for a competition during the colder months, so let’s hope it happens again next northern winter. As far as incredible rentals around the world go, this one takes the cake. 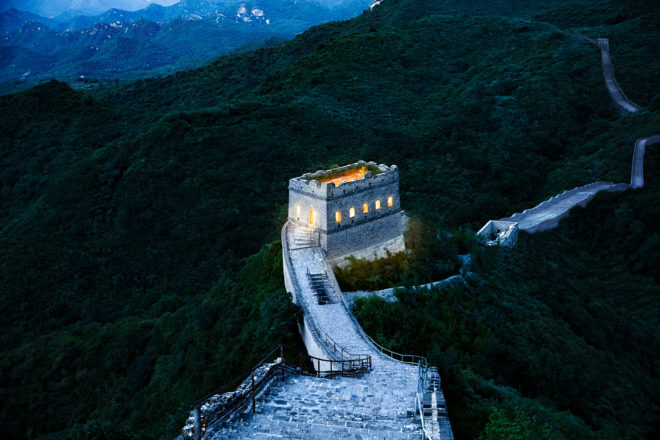 AirBnB has announced a first of its kind overnight experience on the Great Wall of China. 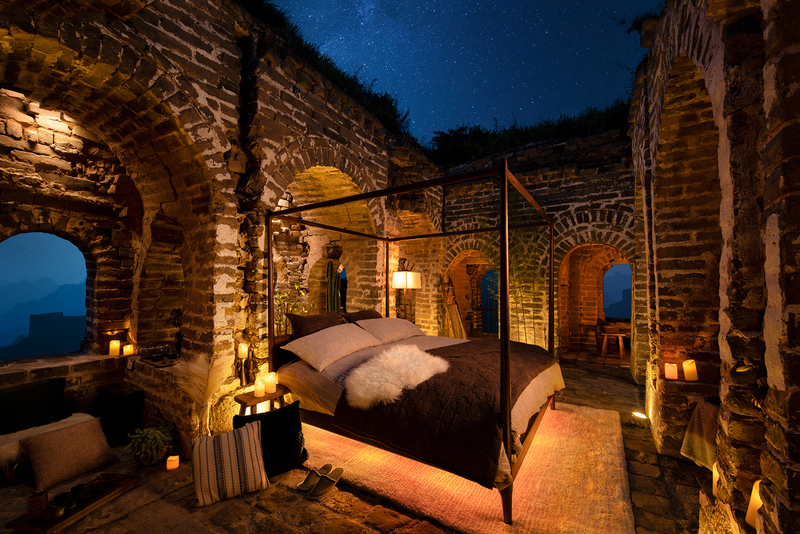 This September, four lucky winners will each be one of the first people in thousands of years to spend the night on the Great Wall of China in a custom-designed home situated along the ancient portion of the wall. This unprecedented level of access will showcase the Great Wall to the world as well as spotlighting a wide range of efforts to preserve the Wall’s deep heritage and bring Chinese culture to life. Known as one of the greatest architectural feats in human history, the Great Wall was built as a border to protect Chinese states against raids thousands of years ago (and to keep the rabbits out). Today, it is widely considered to be one of the seven wonders of the modern world, bringing visitors from all walks of life together. More details and competition information can be found here. 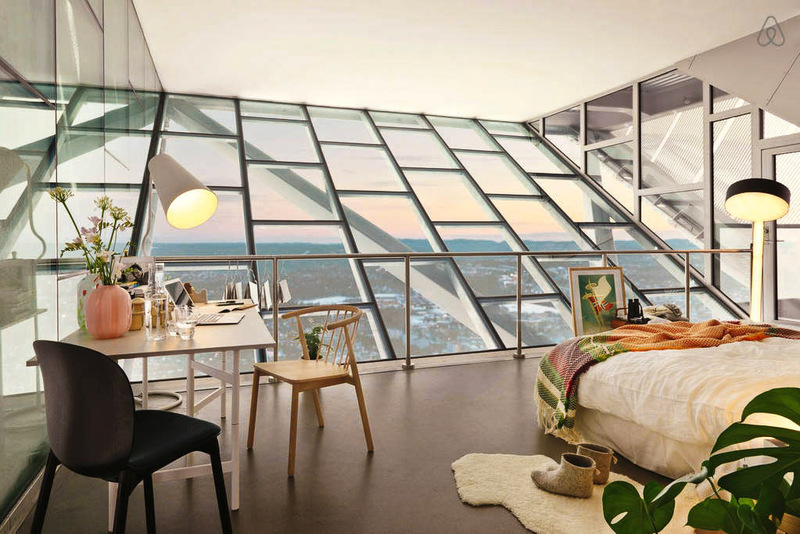 Located at the top of a vertiginous ski jump in Norway, this space is where athletes usually prepare for a jump during events like the Ski Jumping World Cup, but this year it was coolly transformed into a penthouse apartment, complete with panoramic views of Oslo through its ceiling-to-floor windows, and (fingers crossed) the Northern Lights from the rooftop terrace. After perusing the world’s first ski museum just downstairs and breakfasting in the VIP lounge, you can check out via zip-line – yes, you read that right! The space was actually set up for a competition during the colder months, so let’s hope it happens again next northern winter. This private preparatory school in the bucolic Irish countryside, 45 minutes from Dublin, was built in the 1760s for the First Earl of Bective. He later engaged the renowned Neo-classical architect Robert Adams to design a suite of rooms, including an ornate Eating Parlour that has recently been restored. The whole thing can be rented during school holidays to accommodate up to 70 people in dorm rooms, with eight bathrooms, a sports field, tennis courts, swimming pool, cricket pitch, stables, squash courts, a small theatre and a grand ballroom at your disposal. The weekly rental rate starts at $8600, or a mere $28,756 for a month. For a modern architecture tragic, there is no more exciting prospect than laying your head in a house by iconic American architect, Frank Lloyd Wright. Designed in 1939 for Life magazine as an American ‘dream house’ for a typical family earning $5000 to $6000 a year, the architect named it Still Bend. Located on the river bank in the historic fishing town of Two Rivers in Wisconsin, the four-bedroom house features Lloyd Wright’s signature long clean lines and ample use of brick and wood. The property sleeps eight and costs $534 per night: a small price to pay to be surrounded by such architectural brilliance. With room for 13 of your nearest and dearest, Dairsie Castle in Fife, Scotland, will definitely indulge your king (or queen) of the castle fantasies. An easy hour’s drive from Edinburgh (and 45 minutes from lovely St Andrews), during its 800-plus year history the castle has been the location of secret Scottish parliaments, military sieges and the safe haven of a fugitive king (James VI in 1583). The current owners have restored it from ruin to its medieval glory, with lots of 21st-century comforts thrown into the mix. You can rent the entire castle and its 2.4 hectares of grounds for $1199 per night, or a weekly rate of $4395. Tucked into the iconic clock tower of Sir George Gilbert Scott’s stunning gothic revival hotel building above St Pancras railway station, this light and airy fifth-floor mini apartment (complete with 10-metre ceilings, exposed brick and the wrought iron inner workings of the clock) looks out over the rooftops of London. With a double bedroom, ensuite and its own kitchen and living area, it is the ultimate bolthole. There’s double glazing on the windows to block out the buzz of the city and trains below and, for those who like a lie-in, fear not: there were never any bells installed in the clock tower. The suite sleeps four, and costs $300 per night.